15.03.2017 - First wave of beats uploaded, if you'd like to add yours make sure you submit to brapp with the hashtag #beatbattle. Please note that moving forward we will NOT be combing for retroactive use of the hashtag (i.e you edit an old beat's description). Also if you have multiple submissions we will only be taking one (it will be the first beat we would have discovered). Player will be updated roughly every day, if your beat is missing please message Kos at kosyne@louisden.com. 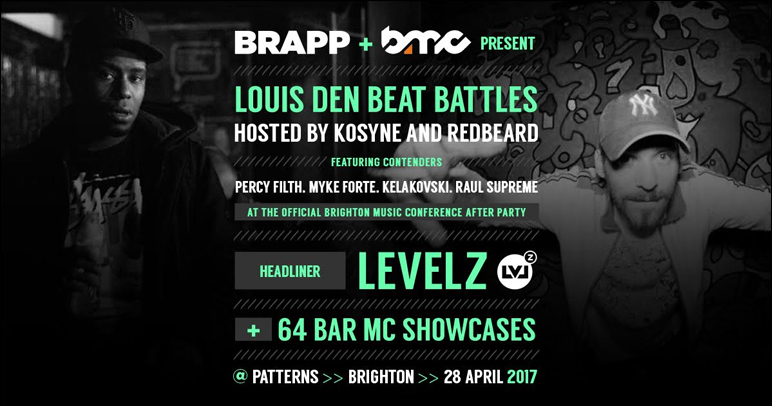 Louis Den and Brapp will be holding a 12 producer beat battle hosted by Kosyne and Redbeard at the Brighton Music conference 2017. Details can be found via the links above. If you've got beats and want to show and prove on centre stage get involved! Beats will be available to stream from Monday 13th March & voting will take place next month in the run up to the event on 28th april, so get submitting! producers from the Louis Den network contending are Percy Filth, Myke forte, Kelakovski & Raul Supreme.